For some of us, finding the motivation to clean isn’t a task that comes easily, if at all. But when you’re rewarded for cleaning up, it makes things a little better, right? By compensating their community members for cleaning up their city, cannabis clubs of Colorado Springs in Colorado has made its citizens some pretty happy individuals. A handful of cannabis clubs in Colorado Springs joined together to create a new community service incentive that exchanges cleanup services for cannabis. Each volunteer was rewarded with one joint per bag of trash collected around different parts of the city. Local cannabis club, The Pothole, hosted one of the cleanup gatherings in the city. by handing out joints to eager volunteers. The owner of The Pothole, Steve Pacheco, came out to help run the show. In preparation for the event, Pacheco and his team rolled over 300 joints to hand out to volunteers, 21 and older, of course. In addition to the turnout being exceptional, Colorado Springs City councilman Bill Murray came out to help his fellow Coloradans collect garbage, and he too was given a nicely rolled joint in return. Councilman Murray, you have my vote. However, the motive behind these cannabis club hosted cleanups is not just about the undying need to save our damaged planet. At the beginning of this month, the Colorado Springs City Council organized a hearing to get ban all marijuana social clubs in the city. The hearing resulted in a six to three vote, calling for all current social clubs to close down their businesses over an eight-year period. For club owners and cannabis enthusiasts, closing down these clubs would be unfortunate. 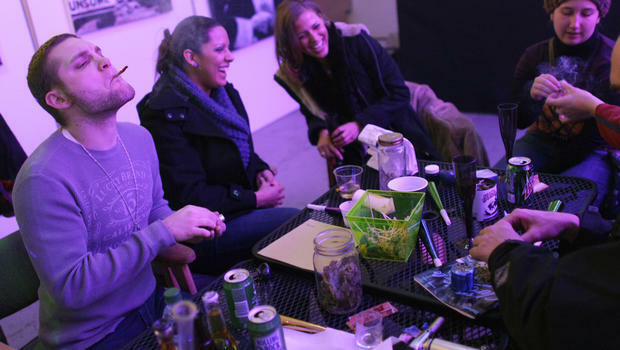 Cannabis clubs allow people to come and smoke at their leisure by providing a safe place for cannabis enthusiasts alike to meet other members of the cannabis community. By hosting a program like a community cleanup, Pacheco and other cannabis club owners they hope to gain more support to keep their businesses open. Those who are in favor of the ban feel that these cannabis clubs promote illegal activity, and parents have concerns about the location of the clubs being in close proximity to schools and parks. Yet, cannabis is legal in Colorado and as long as they aren’t shutting down their bars, they shouldn’t be shutting down cannabis clubs either. Do you think cannabis clubs should be banned? Let us know on social media or by commenting below.